Pioneers in the industry, we offer pegboard racks from India. 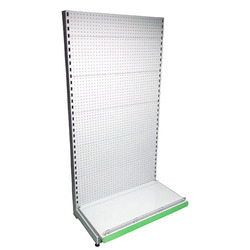 Manufacturer and Supplier of Pegboard Racks, which also termed as ‘Peg panel racks’, ‘Perforated back panel racks’. Expanda stand offers peg panels which are suitable to Wall racks, Island racks and End racks. The peg panels are hooked directly into the slotted uprights wherein the peg hooks can be fixed and displayed. They provide flexible system for storage and general display of products such as crockery, storing cables, cleaning materials and other blister packed items.